WATERFORD — SK Modified driver Kyle James was responsible for the best move of finale weekend — a whirlwind charge coming out of turn 4 to blur past Tim Jordan at the finish line. It was in a qualifying race, however, and not in the 80-lap feature. 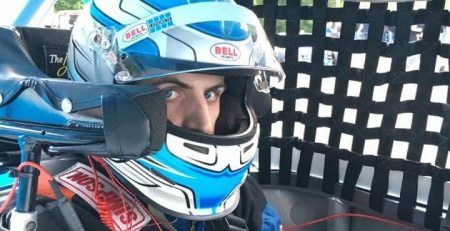 The heat race win, however, gave him enough points to lock up the 2018 SK Modified championship Sunday during The finale weekend at the New London-Waterford Speedbowl. The feature was not as kind to James. He was involved in an incident on lap 22 and was knocked from contention. 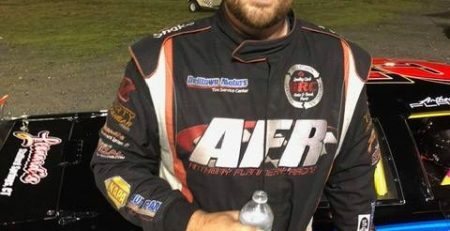 That opened the door for Todd Owen, who held off Ronnie Williams down the stretch to post his fifth win of the season and his second straight. There were many more drivers who had a reason to celebrate besides Owen and James. Anthony Flannery captured the 30-lap Late Model feature and also wrapped up the season title. 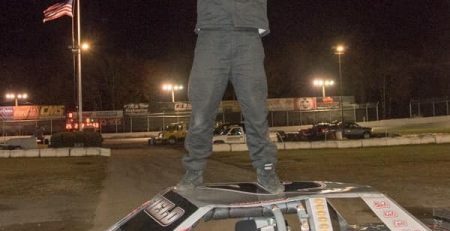 Wayne Burroughs dominated the 25-lap SK Lite feature, but Jonathan Puleo finished second to win the track championship. Al Stone led from start to finish to grab his fourth Sportsman win of the year. As soon as the feature started, however, the championship was decided. Even though Shawn Gaedeke finished 16th, all he needed to do was take the green flag to win the track championship. 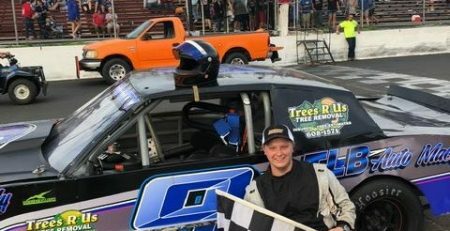 Charles Canfield captured his 10th feature race of the season in the 25-lap Mini Stock feature and also nailed down his second track title. 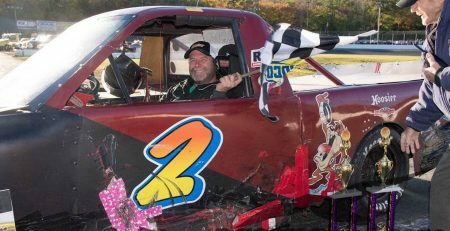 Duane Noll, who already clinched the Speedbowl Truck crown, won the 25-lap feature. The same scenario was true for Peter Bennett, who had already put a padlock on the Saturday Legends title. He cruised to his sixth win of the season. One of the most dominating efforts was from Owen, who took the lead from Rob Janovic Jr. with 52 laps to go and didn’t relinquish it. Williams saved his tires during the first half of the race and whirled through the field in the second half. He didn’t have enough firepower, however, to get past Owen. James, meanwhile, finished 23rd, but he was able to win the title by nine points over Owen. James won eight of 17 races and was in the Top 5 13 times. Flannery came into the Late Model feature with just a five point lead over Jason Palmer. Flannery, however, rumbled into the lead early, while Palmer failed to finish when his car shut off late in the race. Flannery won the title by 15 points. “These past five weeks is like a dream come true,” said Flannery, who ended the year with seven wins, despite not getting his first win until Aug. 8. There was plenty of drama in the SK Lite feature. Point leader Jonathan Puleo was involved in an early accident and was forced to make an unplanned pit stop. He came back out, however, and finished second to win the title by four points over Burroughs, the race winner. Puleo said he was conservative win the final race. Stone, the all-time Limited Sportsman win leader with 54, had a nervous moment at the start of the race. He started in the front row, but fell to the back of the pack. There was a caution flag before the lap was completed, however, and Stone was able to get back his spot in the front. He took advantage of the second-chance opportunity by dominating the rest of the way. Gaedeke didn’t finish, but still claimed the title by virtue of his three wins and 14 Top 5s He topped Jason Chicolas by 28 points. Charles Canfield started the final 25-lap race Mini Stock with a 13-point lead over Doug Curry. Curry did what he needed to do and blasted into the lead, dominating the first half of the race. Canfield was able to track him down with 10 laps to go on his way to his 10th win of the season. 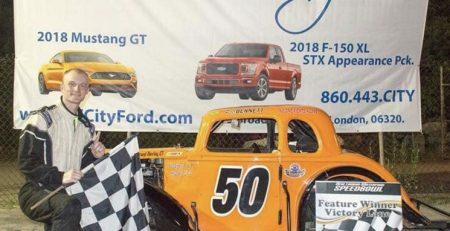 It was the most wins by a Mini Stock driver since Ken Cassidy posted 12 wins in 2012. Canfield’s winning margin was 16 points over Curry. Duane Noll started third in the Truck feature, but wasted no time to getting to the front. He was challenged by first-year driver Lucas Leone, who finished second. Noll topped Todd Taylor by 49 points in the standings. Peter Bennett did what he had been doing all season in the Legends division — rocket his way to the front. He took the lead from Scott Limkemann and held on for his sixth win of the season. Bennett won the title by 52 points over Limkemann. 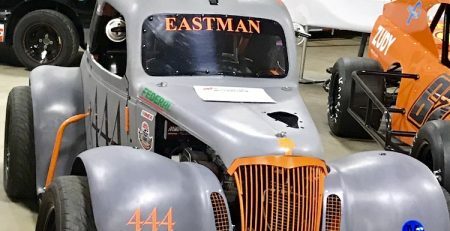 He also became the sixth driver to win both the Wednesday and Saturday Legends crowns in the same season, joining Jags Palmer, Jason Palmer, Anthony Flannery, Dana DiMatteo and Mike Christopher. The season will end Saturday with the annual Octoberfest. A track party will take place at 2:30 p.m. and the action will start at 3:30 p.m. with King of the Hill drag racing, drifting, Big Wheel races, a Compact/Mid Size Enduro, a Full-Size Enduro, a Ladies Enduro, a Trailer Race and a Demolition Derby. 80-lap SK Modifieds: 1. Todd Owen, Somers; 2. Ronnie Williams, Tolland; 3. Rob Janovic, Waterford; 4. Cory DeMatteo, Farmington; 5. Diego Monahan, Quaker Hill; 6. Timmy Jordan, Plainfield; 7. Max Zachem, Preston; 8. Geoff Nooney, Southwick Mass. ; 9. Andrew Molleur, Shelton; 10. Matthew Galko, Meriden. 25-lap SK Lites: 1. Wayne Burroughs, Oakdale; 2. Jonathan Puleo, Branford; 3. Chris Gombos, Naugatuck; 4. Brett Gonyaw, Vernon; 5. Bert Ouellette, Ellington; 6. Christopher Correll, Old Lyme; 7. Nick Anglace, Naugatuck; 8. Pete Lupuch, Redding; 9. Steven Chapman, Ellington; 10. Alex Canestrari, Waterford. 30-lap Late Models: 1. Anthony Flannery, East Hampton; 2. Gerry DeGasparre Jr., Pawtucket RI; 3. Michael Benevides, Westerly RI; 4. Joshua Hedges, New Bedford; 5. Tony Macrino, Waterford; 6. Keith Scalia, North Branford; 7. 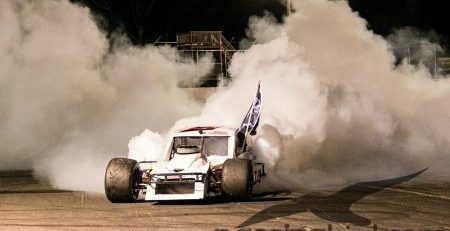 Mark Jenison, Warwick RI; 8. Richard Duranti, Quaker Hill; 9. Jason Palmer, Berlin; 10. Derryck Anderson, Warwick RI. 30-lap Sportsman: 1. Al Stone III; Durham; 2. Diego Monahan, Quaker Hill; 3. Gerry DeGasparre Jr., Pawtucket RI; 4. Ryan Waterman, Danielson; 5. Adrien Paradis, Plainville; 6. Jayson Beal, Ledyard; 7. Phil Evans, Uncasville; 8. Jordan Hadley, Quaker Hill; 9. Bo Norman, Clinton; 10. Jack Aqulina, Oakdale. 25-lap Mini Stocks: 1. Charles Canfield, East Haven; 2. Doug Curry, Groton; 3. Mark Panaroni, Ivoryton; 4. Eric Bourgeois, East Haddem; 5. Andrew Krzemisnki, Haddem; 6. Ian Brew, Wood River Junction RI; 7. Jared Roy, Sterling; 8. Tommy Silva, Gales Ferry; 9. Bill Sylvia, Preston; 10. Nick Pappacoda, North Branford. 25-lap Legends: 1. Peter Bennett, Cromwell; 2. Scott Limkemann, Lebanon; 3. Tyler Chapman, Ellington; 4. Kevin Nowak, Long Island NY; 5. Anthony Bello, Newtown; 6. Brendon Hammann, Smithfield RI; 7. Devon Jencik, Canton; 8. Kyle Rogers, Waterbury; 9. Corey Caddick, Richmond RI; 10. Jacob Burns, Bristol. 25-lap Speedbowl Trucks: 1. Duane Noll, Monroe; 2. Lucas Leone, Southington; 3. Dylan Cabral, Richmond RI; 4. Jeff Karns, Quaker Hill; 5. Rick Ashlaw, Manchester; 6. Tyler Chapman, Ellington; 7. Allen Coates Jr. Uncasville; 9. Brandon Lindahl, Niantic; 10. Andrew Morin, Old Saybrook.